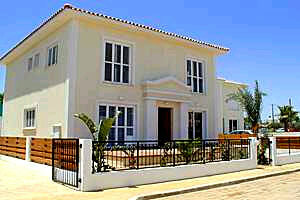 Large, detached, four bedroom villa with private swimming pool in the popular resort of Protaras. 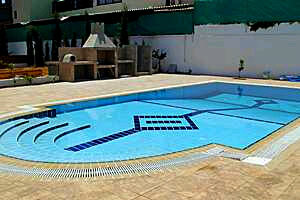 Located in a small private complex just a short walk from the beach at Fig Tree Bay. Sleeps max. 8 persons (with extra camp bed). 3 upstairs bedrooms, One with double bed and two twins. One of the double bedrooms has en-suite facilities (shower, washbasin and w.c.) and all bedrooms have air-conditioning. One bedroom downstairs with a single bed and a camp bed. Upstairs bathroom with bath, shower, washbasin and w.c.. 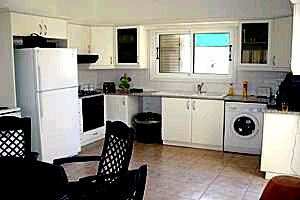 Fully furnished, air-conditioned, open plan lounge/kitchen. The kitchen is fully equipped and features an American style cooker and fridge freezer plus washing machine. Barbecue built-in by pool area. DISTANCES Local amenities (bars, restaurants, shops, mini-markets etc.) 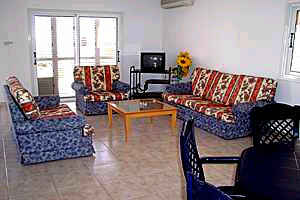 are two minutes walk, and a one minute walk to the beach (Fig Tree Bay). 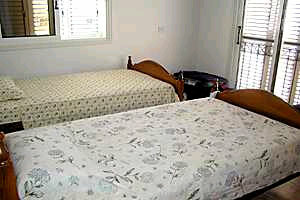 Linen and towels are provided and are changed once a week.